I watched this lizard wait just above a beehive in the trunk of a cottonwood tree (the dark spot on the right). When she saw her chance, she ran down, stopped for a moment, then grabbed a bee and ate it. In the picture on the left, you can see her just about to grab a bee. © Jason Nichols The Desert Spiny Lizard has overlapping scales with sharp spines on the back. A male and a gravid female Desert Spiny lizard meet way up a tree and greet each other with push-up displays, nuzzling, and other interactions during the May breeding season. The tail is slighly longer than the snout-to-vent length. A robust, stocky lizard with large pointed keeled scales. Color is variable - light tan, yellowish, or brownish above with indistinct dark spots or crossbands. There is a black wedge on the sides of the neck. Dark coloring may fade as the animal grows older. Thin dark lines extend from the rear of the eye and mouth towards the posterior. Males have enlarged postanal scales and femoral pores, a swollen tail base, and a bluish patch on the throat and on the sides of the belly with black on the edges. Males often have a dark purple to blackish band with light borders down the center of the back. Females are pale in color underneath with faint or no blue markings. The head of a female becomes orange or reddish in the breeding season. Juveniles lack the dark wedge markings on the neck and have dark and light spots on the back. 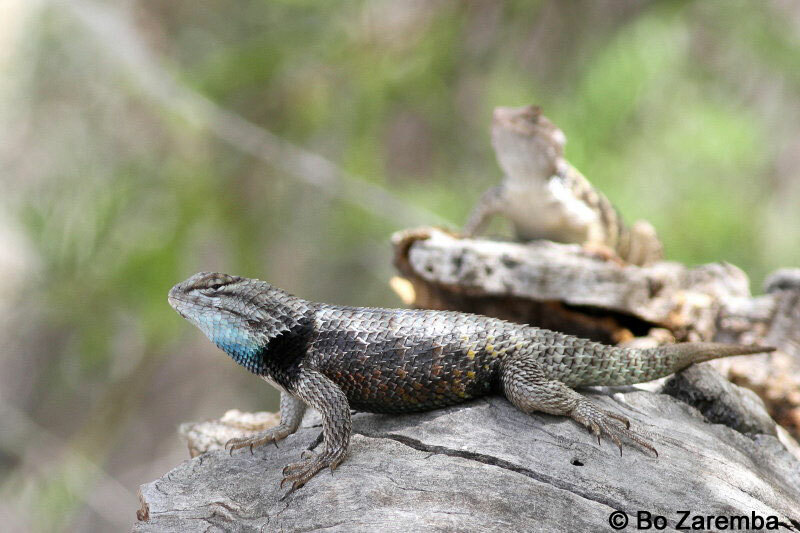 Sceloporus magister and Sceloporus uniformis were once considered the same species, and some herpetologists still consider this to be true. The appearance of both species is so similar that it is difficult to tell them apart. "Desert Spiny Lizards [S. magister] are somewhat larger, and adult males will have a black, deep purple, or red middorsal longitudinal stripe bordered by light stripes…." S. uniformis "…tends to be yellow to tan above, without markings or with less distinctive markings than the Desert Spiny Lizard." Active generally from March or April through October, taking shelter during periods of excessive heat and cold. Sometimes seen basking in the winter. A good climber, often seen on rocks, trees and walls, as well as on the ground. Shelters under rocks, logs and other surface objects, and in cracks, burrows, and woodrat nests. Males stand tall, extend the throat to expose the blue coloring, and do a push-up display to demonstrate their presence and command of the territory, pushing the body up and down repeatedly. Short movie of push-up display. Escapes by running away quickly into brush, rocks, or burrows. The tail detaches easily, but it will regenerate. The tail wriggles after becoming detached which can distract a predator from the body of the lizard allowing it time to escape. Eats a variety of small invertebrates and their larvae including ants, beetles, grasshoppers, spiders, centipedes, and caterpillars, and occasionally small lizards, nestling birds, leaves, flowers and berries. A sit-and-wait predator, though sometimes they will actively forage. Adults are sexually mature at 2 - 3 years. Breeds in spring and early summer, generally May and June sometimes until August. Females lay a clutch of 3 - 19 eggs between May and August. Young are typically seen in August and September, sometimes October. Females may lay more than one clutch during favorable years. 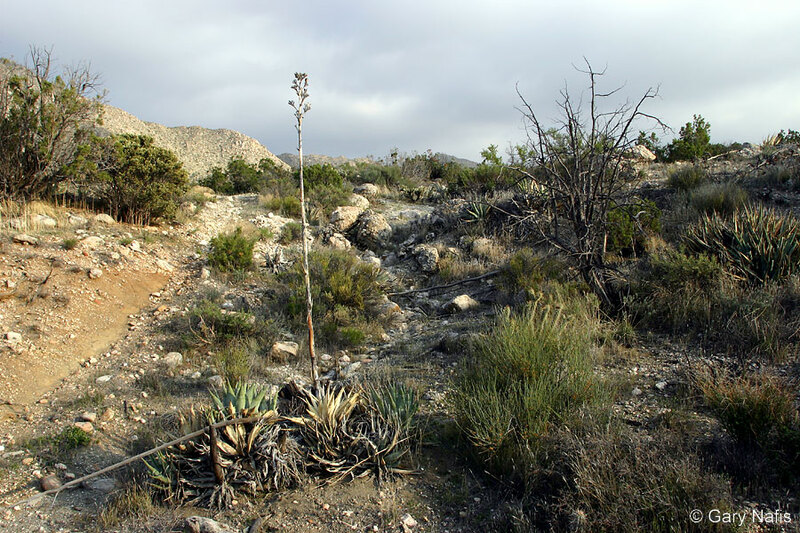 Inhabits desert flats, semiarid plains, low mountain slopes, palm oases, riparian woods, including areas grown with Joshua trees, creosote bush, mesquite, yucca, and grasses. 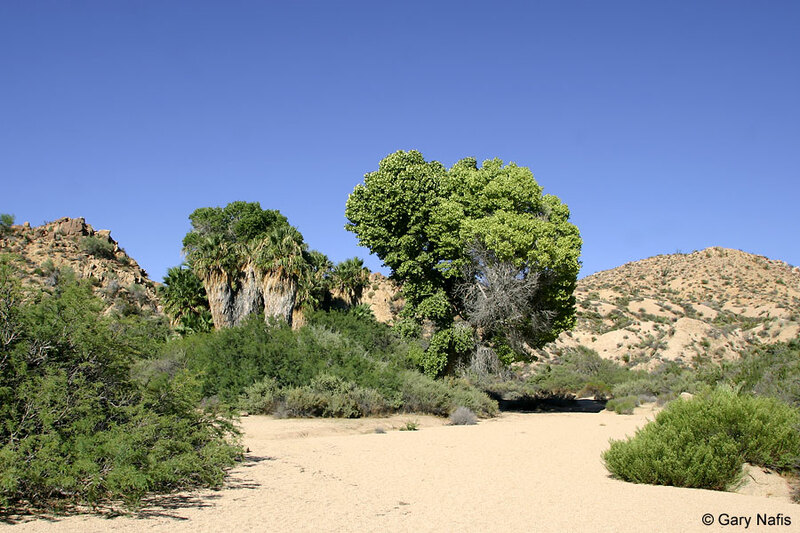 In California, found primarily in the Sonoran Desert region from Riverside County south, from the desert slopes of the peninsular mountains east to the Colorado River, south to the Baja California border. Ranges farther east over west central and southern Arizona into southwestern New Mexico and south along the west coast of Mexico. 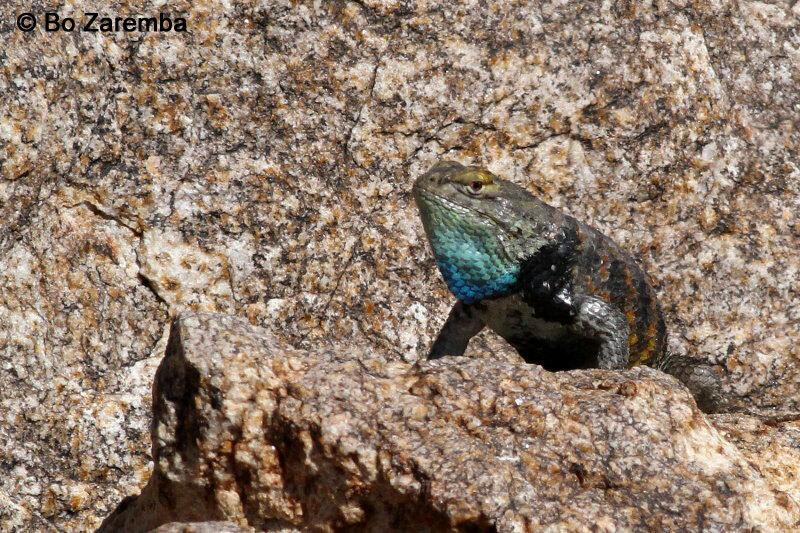 On the Colorado Plateau in northern Arizona and southeast Utah and parts of Colorado and New Mexico, another subspecies, S. m. cephaloflavus - Orange-headed Spiny Lizard, takes over. Determining the northernmost limit of the range of this species is not possible using the locality data of the specimens used in the Schulte, Macy, and Papenfuss 20061 study, or the 2007 Leache, Mulcahy study 2 because there are not enough samples in the entire area across San Bernardino County where S. uniformis meets S. magister. My range map may not be accurate in that area. Lizards in Cabazon group with S. magister, and a specimen from Riverside County in Joshua Tree National Park groups with S. magister, so I show the two species meeting near the junction of Riverside and San Bernardino Counties in that area based on the general description that S. uniformis is associated with the Mojave Desert and S. magister the Sonoran Desert. There maybe some overlap between the species, also. Sceloporus magister taxonomy has been very confusing recently (as of May, 2009). 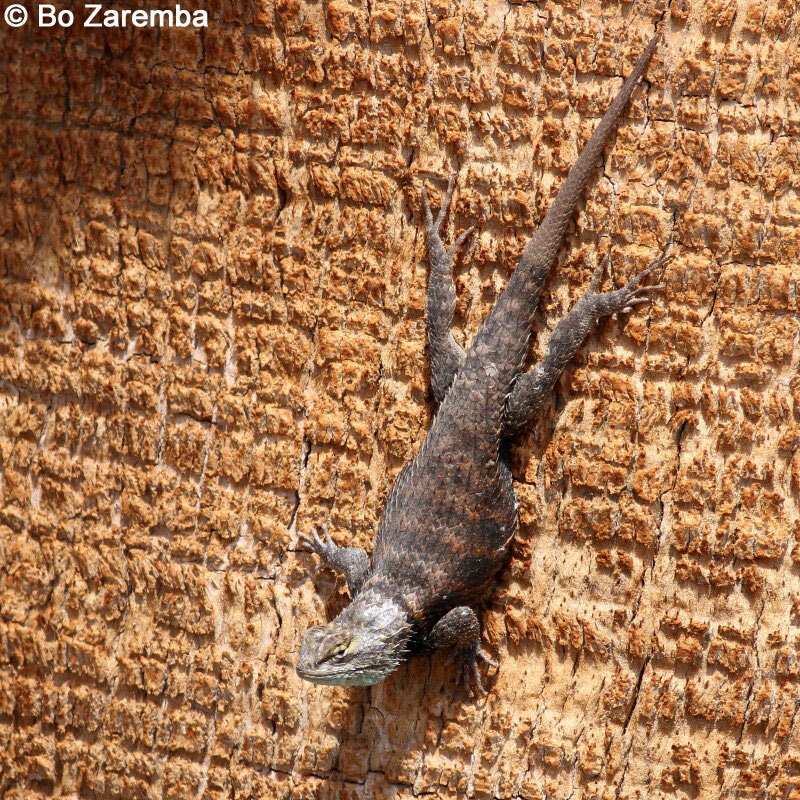 As things stand, Sceloporus magister in California represents either one species, possibly with two subspecies, or two full species, the distribution of which does not follow the distribution of the long-accepted subspecies. In 1996, Grismer & McGuire (1996 Herpetologica 52(3): 416-427) recommended that no subspecies of S. magister should be recognized. 1 In 2006, Schulte, Macey, and Papenfuss split S. magister into three species - S. magister, S. uniformis, and S. bimaculosus, with two subspecies of S. magister - S. m. magister, and S. m. cephaloflavus. However, their sample size was very small which makes it difficult to determine the ranges of these new species in California. In 2008, the S.S.A.R., whose list this web site follows, adopted the 3 species taxonomy of Schulte et al in the sixth edition of their Scientific and Standard English Names of Amphibians and Reptiles of North America north of Mexico list. S. m. uniformis - Yellow-backed Spiny Lizard and S. m. transversus - Barred Spiny Lizard, has been re-arranged into two species: S. magister - Desert Spiny Lizard, and S. uniformis - Yellow-backed Spiny Lizard. S. uniformis now contains the entire former S. m. transversus subspecies and part of the S. m. uniformis subspecies - those lizards from the Mojave Desert north into Nevada and the extreme southwest corner of Utah and the extreme northwestern corner of Arizona and two small areas near the Colorado River. 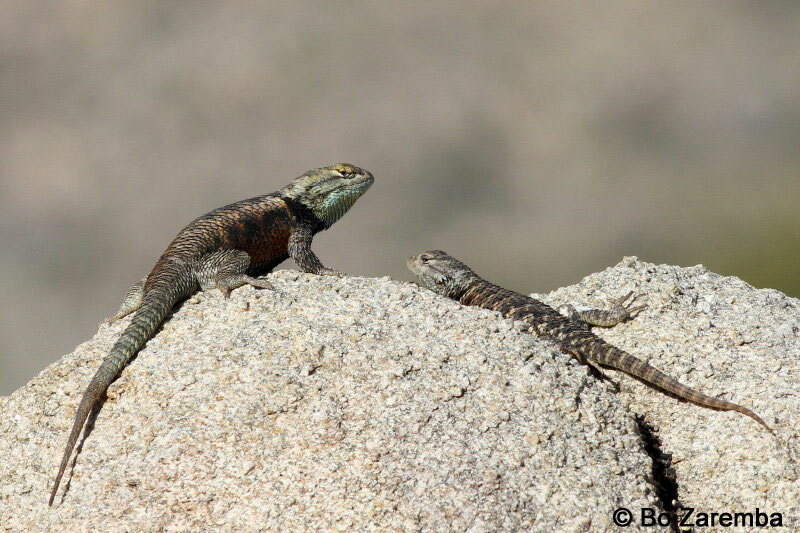 The remaining former S. m. uniformis from the Sonoran desert in California east into Arizona and south into Baja California are now S. magister - Desert Spiny Lizard. The subspecies S. m. bimaculosus - Twin-spotted Spiny Lizard has been elevated to full species - S. bimaculosus - Twin-spotted Spiny Lizard. Subspecies of S. magister are no longer recognized because specimens from closer to the type locality of S. m. cephaloflavus have been found to be part of S. uniformis rather than S. magister. 2 In 2007, Leache and Mulcahy concluded that "S. magister appears to represent a single geographically variable and widespread species." 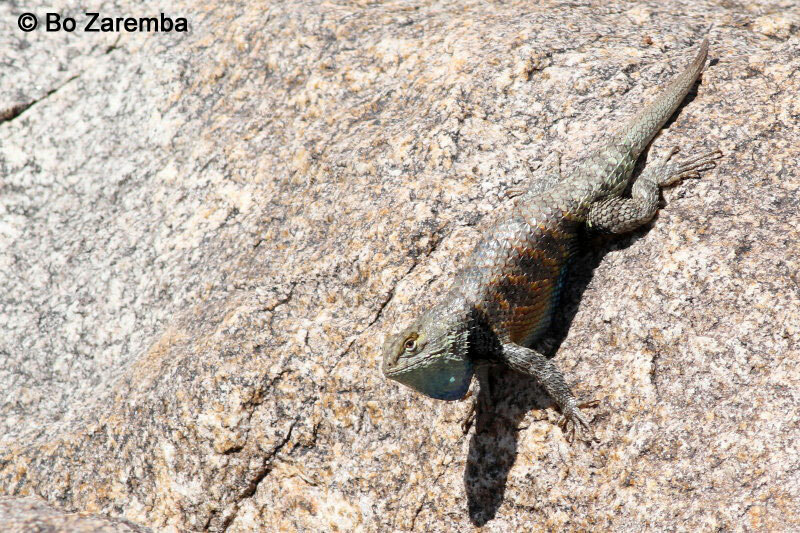 In 2009, Collins & Taggart submitted the 2006 3 species proposal by Schulte, Macey, and Papenfuss to a lizard systematist group which disagreed, leaving them to continue to recognize one species - S. magister - Desert Spiny Lizard. James A. Schulte II, J. Robert Macey & Theodore J. Papenfuss 2006.